A 1932 Lord & Burnham advertisement showing that their greenhouses "can be something besides glass roofs over a garden." This one unfortunately doesn't carry a name with the picture. 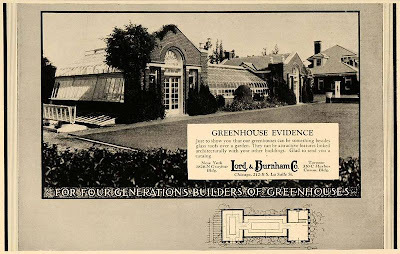 More Lord & Burnham greenhouses. I think this must be my favorite Lord & Burnham ad. Ancient, thanks for the link to the Lord & Burnham book; interesting variations & uses. I counted four on Long Island if you include one to a Pratt in Brooklyn. I also enjoyed the link to Ancient's favorite L & B ad. Ancient, was your favorite part 1) the owner built a tunnel so he wouldn't have to walk outdoors to his greenhouse or 2) that the picture shows a swimming pool inside a greenhouse with one end made to look like a river bank? Or maybe the comment that outdoor swimming pools are a thing of the past ... today L & B would say, "four out of five pool owners prefer their swimming pool be inside our greenhouse;" & you couldn't prove them wrong. 2) Two rooms that don't appear to connect on the interior with the greenhouse rooms; one can enter them only from the outside. I understand they must have a different purpose; I'm just surprised there's not an interior connecting door. Off subject...Does anyone have any info on "Highpool", the Deering Howe estate in Brookville? I believe now its a Lutheran high school. It's the tunnel that I like. I know someone in the country who did this about fifteen years ago. He'd built a "spa complex" with a pool and then decided it was beneath his dignity to walk there wearing nothing more than his bathrobe. The resulting tunnel cost more than $500,000. School link has some additional info. Photos of Howe and daughter. Scrool further down - photo of Dolly Von Stade Bostwick.